ARTIFACT: This is a great 1969 Joint US Nave and RVN (Republiv of Vietnam) Navy Operation Sea Float (RVN: Tran Hung Dao III) jacket patch made in Japan. 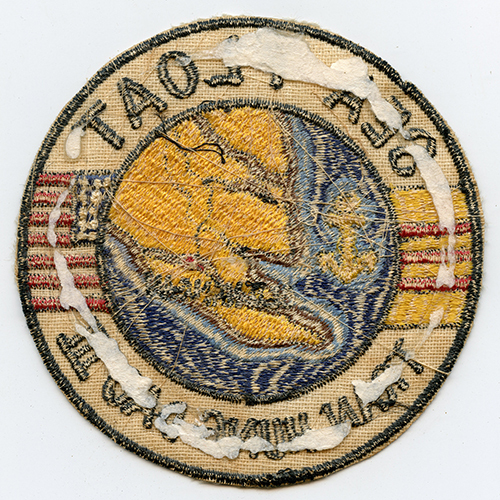 The patch depicts a map of the south peninsula of Vietnam with a map marker reading �OLD NAMGAN� On the left and right side of the patch is the South Vietnam flag and the American flag respectively. SIZE: Appr: 3-3/8� in diameter. CONDITION: 8- (Very Fine-Excellent): There is only slight fraying. The patch has been removed from a scrap book, so it has some glue and paper residue on the reverse. 1969 Japanese Made Novelty Jacket Patch for the USS Volador SS-490 West-Pac "Beaver Patrol"